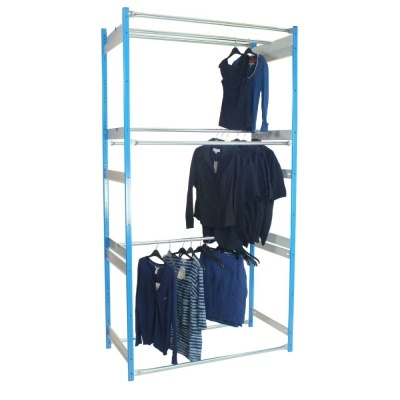 Commercial grade garment racking unit with three inboard hanging rails. Made from commercial grade Trimline components, these garment bays are designed to last and are a common sight in many of the UK's leading retailer and fashion brand stockrooms. This extra tall storage unit is ideal when a mixture of hanging and folded garments need to be stored efficiently but you will need a step ladder to access the higher levels. The middle shelves and rails can be adjusted to create hanging storage spaces that perfectly suit your goods. Choose a starter bay for a single standalone rack or use cost-effective add-ons to create long runs of connected garment racks. The inboard configuration of this unit retains the clothing within the rack - therefore minimising the overhang of garments into the aisle.